Nearly half of all college students are twenty-five or older. Yet no publication has ranked the top schools for them. Until now. You can find our full rankings of the best four-year colleges for adult learners here and the best two-year colleges for adult learners here. Go to almost any college website and look at the PR photos of the students. The first thing you’ll probably notice is their diversity: white, black, Latino, Native American, Asian, Middle Eastern, all the colors of the rainbow. What you might not notice, at least at first, is what they all have in common: their age, late teens and early twenties. The reason you might not notice this is that it seems natural: in our mind’s eye, colleges are places filled with fresh-faced young people who recently graduated high school. But in the real world, that’s no longer the case. More than 40 percent of the 20.2 million students attending American colleges and universities are adults, defined as twenty-five years old or older. This is not a new trend, and colleges surely know all about it. Yet the fact that the PR photos on their websites don’t reflect that reality indicates just how behind the curve most of them are in adapting and catering to this huge and growing demographic. Unlike traditional undergrads, adult learners tend to juggle full-time jobs and family responsibilities, and so they have trouble fitting daytime classes into their schedules. Yet few colleges offer anywhere near enough evening, weekend, and online classes to complete a degree, or—banish the thought—provide on-campus daycare. Many adult learners are returning students who have earned college credits elsewhere. Yet too often, colleges won’t accept a lot of those credits, forcing adult students to spend more time and money to get their degrees. Adult learners typically have learned-on-the-job knowledge of the subject they’re hoping to major in—a bookkeeper studying accounting, for instance. But precious few colleges offer tests that can let these students earn college credit for that knowledge—“prior learning assessments,” in higher ed speak. The failure of so many colleges and universities to meet the needs of adult learners hurts us all. It diminishes upward mobility, robs the economy of needed skills, and slows our efforts to catch up with other countries in the percentage of our population with post-secondary credentials. And it’s not just the higher education system that has failed to adapt to the needs of adult learners. So has the press. The ever-growing number of publications that rate and rank American colleges and universities—U.S. News & World Report, Forbes, Money, Barron’s, Fiske, the Princeton Review, Kiplinger’s Personal Finance, the New York Times, the Times of London Educational Supplement—all focus mainly on high school students and their families. None rank colleges based on which serve adult students best. Until now. 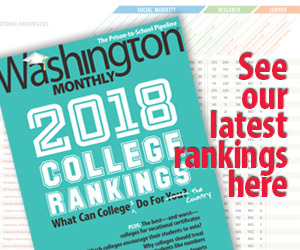 In this issue, we inaugurate our first-ever rankings of the best colleges for adult learners. To create them, we pulled data from two federal government sources: the Department of Education’s Integrated Postsecondary Education Data System (IPEDS) survey and the department’s new College Scorecard database, released last fall. We also are grateful to have been given key results from the College Board’s Annual Survey of Colleges. We combined all these numbers into seven general measures of colleges’ openness and responsiveness to adult students and to how well those students fared once they left. Our rankings for four-year schools can be found here, for two-year schools here. Our detailed methodology is here. At the top of our list of four-year schools is San Francisco’s Golden Gate University. This 110-year-old institution, which started as a night law school, has long been devoted to the needs of adult learners. That devotion shows up in one of our measures: fully 88 percent of Golden Gate’s students are adults (the higher that percentage, the higher a school scores on our rankings). Golden Gate also does well on three metrics of adult student friendliness: “ease of transfer” (how open a school is, for instance, to accepting credits earned at other colleges, and whether it lets adults enroll without having to take tests like the SAT); “flexibility of programs” (whether it offers things like weekend and evening classes and prior learning assessments); and “services for adults” (financial aid counseling, on-campus daycare, job placement, specialized services for military veterans, and so on). Golden Gate does poorly on one metric, tuition and fees (at $14,640 per year, it’s relatively expensive), and middling on another, whether adult students are able to pay back at least some of the principal on their loans five years after leaving college. But it partially makes up for that in another important measure: earnings. The mean income of adult students ten years after they enter Golden Gate University is $73,166, the eighteenth highest of the 571 four-year schools we looked at. Several other four-year colleges that traditionally focus on adult learners also do well on our rankings. They include Regis University, a private nonprofit in Colorado (number twenty-two); Charter Oak State College in Connecticut (twenty-eight), University of Maryland’s University College (fifty-three), and the State University of New York (SUNY) Empire State College (sixty-three). So do a smattering of highly regarded state flagships, like the University of Iowa (thirteen) and Indiana University Bloomington (fifty-seven). Equally instructive are the schools that don’t make the list. No for-profit colleges score in the top 100—though one, Walden University in Minnesota, a private institution organized as a “public benefit corporation,” clocks in at number nineteen. Also absent are Ivy League colleges, or indeed any of the private elite institutions that crowd the top of U.S. News’s rankings. Few of these institutions even made it into the 571 schools we looked at. That is because they enroll too few adult students for the federal government to provide statistically reliable loan repayment and earnings data. For the most part, these elite schools simply aren’t in the business of educating adults. Instead, our top 100 four-year list is dominated by the kinds of workaday schools—Montana State University Billings (number fifteen), University of Missouri–Kansas City (number twenty)—that U.S. News tends to ignore. But according to our data, they deserve three cheers for providing affordable, career-enhancing college educations to America’s working adult students. Community colleges seldom enjoy national reputations. One that does, Miami Dade College in Florida, the second-largest institution of higher education in the country, comes in at number seventy-nine on our ranking of the 100 best two-year schools. Mostly, though, the colleges on our two-year list are largely unknown outside their communities but warrant national recognition for delivering big-time for adult learners. Inver Hills Community College in Minnesota (number seven) garnered the highest scores possible on our ease of transfer and flexibility measures. And students at number one–ranked Weber State University in Utah, which grants mostly two-year degrees, earn an impressive $50,867 on average ten years after enrolling in college—the sixth-highest income among the 1,171 community colleges we looked at. Every year, millions of adult Americans make the decision to go back to college to earn the degrees they need to advance their lives. We hope these rankings will help them pick colleges where they have the best chance of achieving their goals. Just as important, we hope that by honoring colleges that do right by adult students, we’ll spur more colleges to do the same.